Sixpoint is based on the idea that forward-thinking experimentation and formulation is ceaseless, but carried on the shoulders of tradition—and no communal drinking tradition is stronger than that of the British pub. Pubs are an essential gathering point for the community, a place for good company, convivial sessions and great beer. 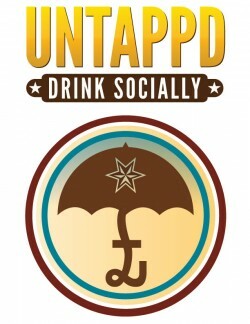 So we’re proud to announce that as of March 5th, 2014 Sixpoint beer will be available in hundreds of British pubs. We’re going two routes for our UK occupation: First, in collaboration with Adnams, a highly-respected brewery in Southwold, England that sports a state-of-the-art facility, we’ve been making cask ale in classic English style. Our small-batch facility does churn out some casks, but the brewing at Adnams is our first foray into large batches of cask-specific format. Previous trips to the UK have seen visits from our Founder, Brewmaster, and other Sixpoint brewers. Thus far, Bengali Tiger and Righteous Ale on cask have been amazing, and we recently crafted a brand new recipe, “Make It Rain,” that’s packed with loads of New World hops. The Real Ale fans of Britain have started to take notice. Real ale, for those uninitiated, is unfiltered and unpasteurized beer, conditioned and served from a cask without the addition of any nitrogen or carbon dioxide gas. CO2 is a natural by-product of fermentation, so cask beer is not flat, but is more delicately carbonated than most beer served from a keg. A beer served on cask is a much different experience, ideal for showcasing subtle nuance in intricately crafted brews. 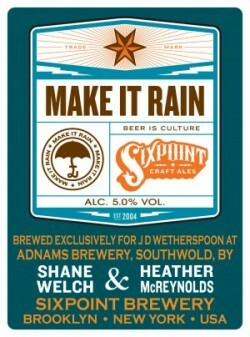 In honor of our collaborations with Adnams, we’re also releasing an Untappd badge for Make it Rain. And then beginning March 5th, we’ll also start offering canned favorites, Sweet Action, Bengali Tiger and Crisp, in 12 oz, stubby nano-kegs. Exported from the US, these Sixpoint originals will give Brits a proper taste of American Craft Beer. We couldn’t be more excited to be a part of the craft beer conversation across the pond.